When it hit the market a few years ago, ADJ’s mold-breaking AV6 panel made large-format LED video display screens attainable for many production companies and mobile entertainers, as well as churches, nightclubs and concert venues, where this technology would have previously been too costly. Since then the AV Series has expanded to include the high definition AV3 panels as well as a host of associated accessories. If you need a big LED screen of any shape for a fixed or touring indoor application, the AV Series has you covered. But what if you need a screen that can be used for outdoor events? That’s where the latest addition to the AV Series comes in, the weatherproof AV4IP. With a pixel pitch of 4.81mm, the AV4IP sits between the AV3 and AV6X in terms of resolution, but what sets it apart is its IP-rated weatherproofing. The front of the screen is designed to comply with the IP65 standard, while the back of the unit is IP54 compliant. This means that the surface of the screen is fully protected against rain, snow and dust, while the back panel is protected against splashing water but isn’t completely dust tight. The screen is therefore ideal for use at temporary events in the open air and can also be used as part of a permanent outdoor installation as long at the rear of the panels are protected from the elements. Featuring 3-in-1 RGB SMD1921 LEDs, the AV4IP offers an impressive brightness of 4000 NITS, making it ideal for outdoor use even in daylight. However 0-100% brightness adjustment also means that the intensity of the screen can be dialed down if necessary. Each panel contains 104 x 104 LEDs, which is equivalent to 43,264 dot/m2, and offers a wide viewing angle of 140-degrees. As with the other models in the AV Series, the AV4IP is keenly-priced and has been designed to be simple to setup. An internal 14-bit Novastar data receiving card means that multiple panels can be linked together using standard ethernet cables connected to one of ADJ’s range of video processors. Mains power for multiple panels can also be linked together and each will draw a maximum of 180W and an average of just 60W. Weatherproof True1 powerCON and etherCON input and output sockets are provided, to protect the connections from water splashes and the panels can accept an input voltage of 100-240V 50-60Hz, meaning that they are suitable for use worldwide and therefore capable of global touring duties. Each panel measures 19.75” x 19.75” x 4” / 500 x 500 x 100mm and is divided into two separate 250mm x 500mm modules. This, along with quick-release power supply and receiving card modules, allows for easy serviceability and simple repairs out on the road. Weighing just 20 lbs. / 9kg, and fitted with a retractable carrying handle, the AV4IP is easy and convenient to lift, carry and rig. 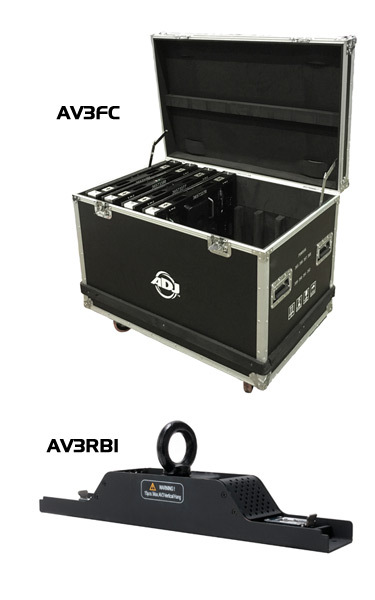 Up to eight AV4IP panels can be stored and transported using ADJ’s AV3FC flight case. Featuring a full foam lining and independent slots for each unit, the robust case offers complete protection for a set of panels on the road. 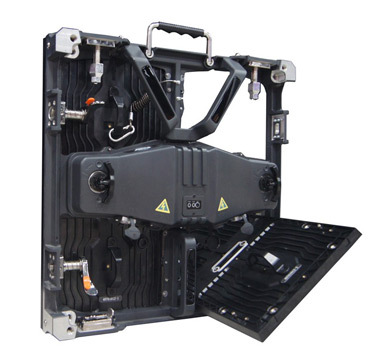 It has been designed specifically for use with ADJ video panels and is constructed from 9mm plywood and fitted with steel ball corners, aluminum edging, large swivel castors, professional butterfly latches, four sprung handles and a hinged lid. The AV4IP is also compatible with ADJ’s AV3RB1 rigging bar. This easily and securely locks to the top of the first panel in a vertical hang of up to 15 AV4IPs and allows them to be hung from a truss, hoist or roof beam. A choice of video processors are offered by ADJ which can be used to convert a standard video signal (HDMI, DVI, VGA etc.) for use with the AV Series LED panels. These range from the basic and cost effective MCTRL-300, which will drive up to 1.3 million pixels (30 AV4IP panels,) up to the advanced Novastar VX4S, which will drive up to 2.6 million pixels (60 AV4IP panels) and can be cascaded in multiples to create screens of unlimited size. To take some of the guesswork out, ADJ has put together two popular LED Video Wall packages in the most popular configurations. The AV4IP 4x2 includes 8x AV4IP panels, 4x AV3 rigging bars, 1x AV3 flight case, 1x MCT RL300 video processor, Media Master Express software and all the power and data cables needed. Then, the AV4IP 5x3 includes 15x AV4IP panels, 5x AV3 rigging bars, 2x AV3 flight cases, 1x MCT RL300 video processor, Media Master Express software and all the power and data cables needed. The AV4IP is an affordable high-resolution video panel that can be used both outdoors and indoors, making it a versatile investment. It is available now, both as single panels and complete packages that include video processors, software, cabling, rigging bars and flight cases – everything you need to get an LED video system up and running.